In 2015, there were 372 mass shootings in the U.S., defined by the Department of Homeland Security as a shooting which involves four or more casualties. 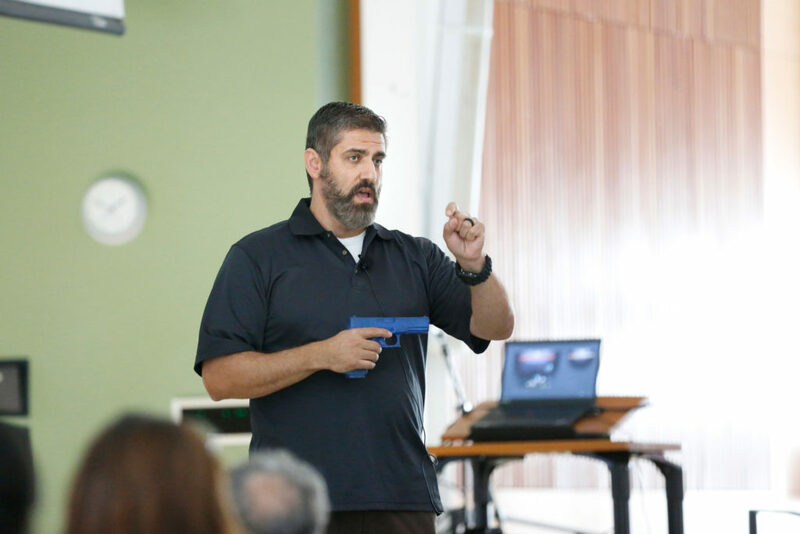 In response to public interest, UC Santa Cruz’s Police Department (UCSC PD) hosted an active shooter response seminar, which over 100 people attended on Oct. 20 in the College Nine and Ten Multipurpose Room. Police Chief Nader Oweis talks about protocol for active shooters on campus. Photo by Stephen de Ropp. 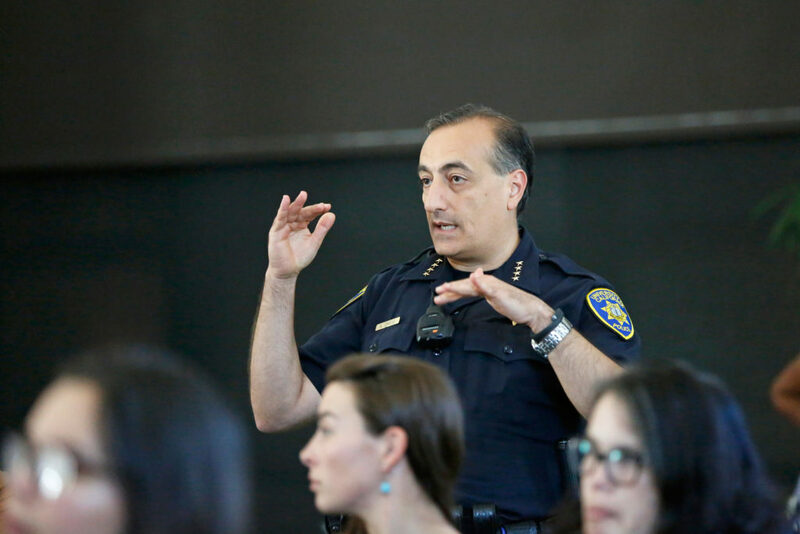 Opening the seminar, UCSC PD Chief Nader Oweis stressed the importance of empowering oneself with the knowledge of how to respond to an active shooter situation. What to do first entails adhering to the practice of “see something, say something, do something,” often broadcast in airports and train stations throughout the globe. Namely, if you see disturbing, dangerous or otherwise suspicious behavior — call 911. The faster the call goes out, the sooner officers can respond and call backup. Oweis assured the audience that UCSC’s officers are well trained in de-escalation techniques, and one shouldn’t hesitate to call for fear of escalation. “Our whole mantra is to keep the peace, care-take and then enforce the law, in that order,” Oweis said. Beyond this, one should obey all lawful orders and do everything in their power to leave the “hot zone,” as dangerous areas are referred to by law enforcement, and keep others from going toward it. But fleeing isn’t always possible, and there are misconceptions surrounding the correct course of action if you end up trapped in a room near an active shooter. Many of those misconceptions stem from erroneous beliefs about the shooters themselves. Basim Abu-Hamid, a retired Sunnyvale police officer and firefighter who served as a guest speaker for the seminar said too often people think anyone brandishing a firearm must be some tactical genius with lightning reflexes and perfect aim; following their instructions has to be the only way to survive. The profile for most active shooters, however, is a socially isolated individual who lacks confidence and occupies a position of relative powerlessness, Abu-Hamid said. They are acting out of a need to feel powerful and significant. When a confrontation with a shooter is unavoidable, you and everyone else around you shouldn’t cower and cooperate, but aggressively attempt to bring them down using whatever tools are available. As counterintuitive as it may seem aggressive action, even by one unarmed individual, is the most effective countermeasure to stop an active shooter. To practice this, the seminar concluded with a simulation in which audience members subdued a mock shooter who entered the room armed with a toy gun. Participants fanned out in a semi-circle just outside the door, and threw Nerf balls as proxies for cell phones, shoes, staplers and other blunt objects. Someone also used a silly string canister as a stand-in for a fire extinguisher, which can be used to both blind or bludgeon the assailant. As an example, Abu-Hamid referenced the Thurston High School shooting that occurred in 1998, where a junior on the wrestling team stopped the shooter by tackling him to the ground and disarming him as he reloaded. “Shelter in place is just not enough,” Abu-Hamid said after the seminar. Having gone through the training, many felt like they were more informed and prepared — as much as one could be.